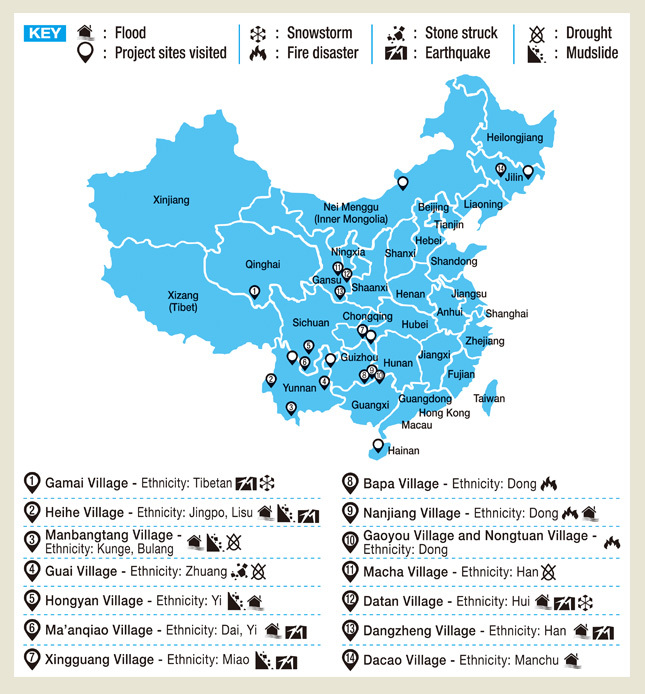 The Ethnic Minority Health Project targets remote, rural, ethnic minority-based communities in China that live under extreme poverty (less than US$1.25/person/day). These communities are typically deprived of knowledge and material resources to mitigate the impact of disasters, and are exposed to major human security health risks. Below is a map showing the proposed and visited project sites. After a site is selected, more in-depth health needs assessments are conducted through household interviews, focus groups, and environmental analysis. The needs assessment particularly focuses on the community’s disaster preparedness, by collecting information regarding their general health status, food and water security, proneness to infectious diseases, as well as their access to healthcare services. During the needs assessment, the project team collaborates with the community leaders to identify specific disaster-preparedness solutions that are relevant and useful for their situations.